them upside down in the middle of the table. Cut around the outside of the black and white Humptys. Laminate them. They are the game cards. Give one to each child. Have the children pick up a card. have that piece they put it back. 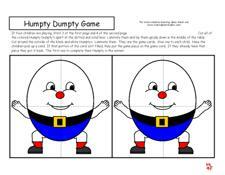 The first one to complete their Humpty is the winner.